White linen shade has brushed nickel accents at top and bottom for a rich contemporary look. Includes 6 feet of chain for height adjustments. Fixture hangs from matching decorative ceiling plate and is suitable for vaulted ceilings. 3-Light Ceiling Pendant with Linen Shade in Brushed Nickel White linen shade has brushed nickel accents at top and bottom for a rich contemporary look. Includes 6 feet of chain for height adjustments. Fixture hangs from matching decorative ceiling plate and is suitable for vaulted ceilings. 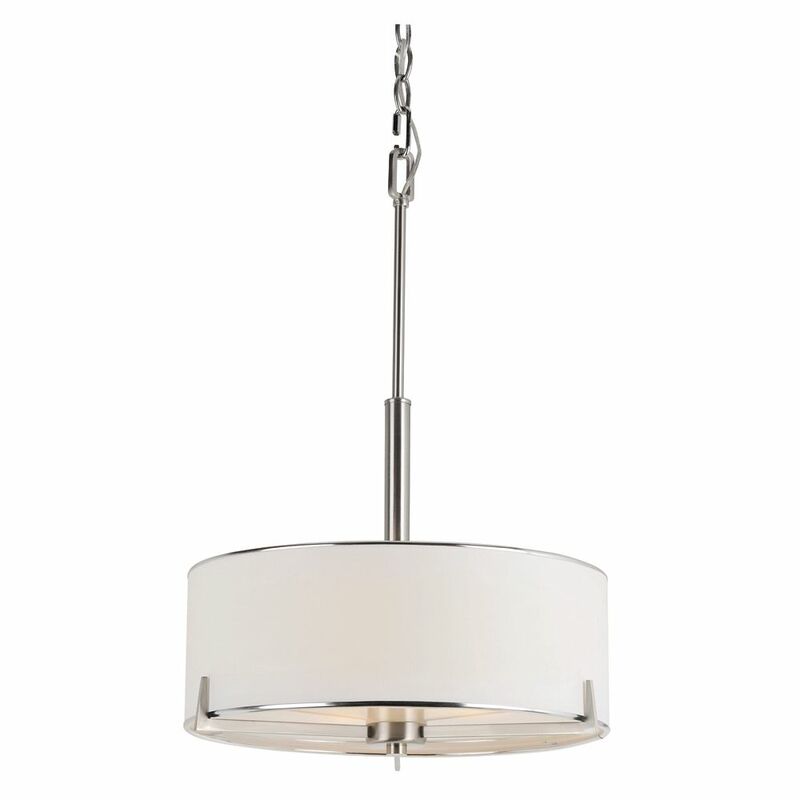 3-Light Ceiling Pendant with Linen Shade in Brushed Nickel is rated 4.3 out of 5 by 9. Rated 5 out of 5 by Ernie from The light fixture more than met our expectations. It was a gift for my wife, and she was very pl... The light fixture more than met our expectations. It was a gift for my wife, and she was very pleased. Rated 5 out of 5 by Prashant from Received the item promptly and works and looks great. Happy... Received the item promptly and works and looks great. Happy with purchase. Rated 5 out of 5 by HomeDepotCustomer from Looks great - just the right size for the space! Looks great - just the right size for the space! Rated 2 out of 5 by Mary from Disappointing The instructions to install this product were translated to English and did not make sense. The linen shade is too thin and the light bulb can be seen through the shade. Rated 5 out of 5 by ZebraLeopard from Looks great, installed as expected.... Looks great, installed as expected. Rated 4 out of 5 by JK60626 from This is a very good fixture for the price-point. I installed it in a rental property to provide a... This is a very good fixture for the price-point. I installed it in a rental property to provide a more stylish-looking fixture than the typical apartment chandelier. You do need to have some handyman skills and basic tools to assemble this fixture because 1) the instructions are a diagram rather than details steps and 2) you have to cut the electric wires and decorative chain to place the light at the desired height. As a side note, the fixture I received was missing two pieces of hardware and the grounding wire. It was easy to replace the missing pieces with a trip to the local hardware store. Rated 5 out of 5 by Anonymous from The perfect pendant Great finishing touch to my kitchen remodel. The lighting is bright but not glaring. It looks really pretty. Yes! We have it on a standard dimmer. does this light fixture have a bottom piece that hides the bulbs? Does this fixture have a diffuser at the bottom, under the bulbs? Yes it has a diffuser at the bottom, under the bulbs. Hi Harry, this pendant comes with 96 inches of chain and 120 inches of power cable.